A new publication launched last month at the White Cube Gallery in Bermondsey explores the ways in which the creative process is documented. In All This Stuff: Archiving the Artist, fifteen leading artists, archivists and art historians reflect on the different ways in which artists and archivists deal with ‘all this stuff’, and how artists manage and relate to their own archives. It looks at the innovative ways in which the arts are challenging the archival process and looks at both the distinctions and the crossovers between artworks and archives. Valuable insights are given into the archival process, addressing questions about what material artists should be keeping and what may happen to it after it has been accepted by an archival institution. This book also explores how archives can be made accessible using original and non-traditional approaches, and considers the unpredictable ways in which they may be explored and interpreted in the future. 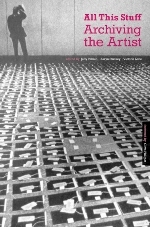 The three editors are Judy Vaknin, Karyn Stuckey and Victoria Lane, all of whom are archivists with experience of the care and management of archives pertaining to the work of artists and designers. June 11, 2013 by Fiona Waterhouse.